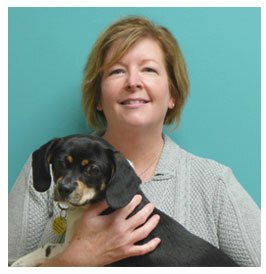 Dr. Jennifer Wells earned a degree in Microbiology from Eastern Michigan University and received her veterinary degree from Michigan State University’s College of Veterinary Medicine. She has enjoyed a diverse veterinary career which has included traditional clinical positions, relief work, and instructing veterinary technology students. She is passionate about using her veterinary training in underserved areas of the world and has volunteered in Haiti, Honduras, post-Katrina Louisiana and Mississippi, and along the Iditarod trail in Alaska. When not in the clinic, Dr. Jen enjoys organic gardening, quilting, sewing Little Dresses for Africa, volunteering at church, and playing the French horn in groups near her home in Manchester. Dr. Jen shares her home with a loveable collection of critters which includes her husband (also an MSU-trained veterinarian), a feline-obsessed daughter, a pair of hamsters, an inseparable cat and dog, the occasional foster pet, and a handful of chickens.